Green and White 3-strand Polysteel Rope with a red tracer yarn sold by the coil, by the reel and by the metre. The following diameters are available in the green: 8mm, 10mm, 12mm, 14mm, 16mm, 18mm, 20mm & 24mm. For larger diameter polysteel rope (28mm - 36mm) please visit our Synthetic Sisal Ropecategory. We also stock leaded polysteel pot rope (10mm – 16mm) which can be seen in our Leaded Polysteel category. Polysteel fibre rope is made from extruded filaments resulting in a rope that is superior to both polypropylene rope and polyethylene rope. This makes it a hands down choice for marine, agricultural and industrial applications where a highly superior product is demanded. 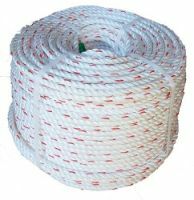 Please click on the icons below to buy this polysteel rope by the coil, by the reel or cut to length by the metre.